2011 might be all about minipigs here, but Oink! is not my only book to be published this year. Lazlo Strangolov's Tooth & Claw is the second in a series of East European tales of mystery and suspense for young readers. The first, Feather & Bone - about spooked chickens and a battery farm producing a very special cut of meat - was nominated for the 2010 Carnegie Medal. This one is about a zombie beagle. It's a cross between Lassie Come Home and Day of the Dead. Would the doctor erupt if he was wise to the kind of animal testing going on in the clinic's lab, or does he have a hidden interest in developments? Could Scud be responsible for licking roadkill back to life? A demon badger is bad enough, but can that really be a zombie swan? And how do you walk a part-decomposed hound without attracting attention - or flies? Scud may be a one-eyed corpse dog, but as bedlam grips the town he can still smell a mystery. When the beagle goes missing, Lumina must fight tooth and claw to save his life. Again." 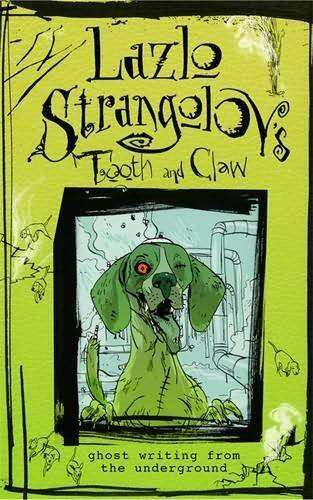 Lazlo Stranglov's Tooth & Claw (illustrated by poor, frazzled Quinton Winter) is published in the UK by Walker Books on 7th February 2011.